With the dark god Morrigu haunting his dreams, the warrior and champion Culainn journeys north in search of a merchant's daughter abducted by clansmen. With a desert princess as a companion he will travel through a land baked by a scorching sun, where bandits roam free and dark beasts stalk the night. An ancient evil is rising from the desert. A Benouin myth of a ghost city inhabited by the souls of their ancestors, a bridge to the Underworld is unleashing demonic creatures on an unsuspecting world. Culainn and Persha, warrior and mage, stand alone against a tide of darkness. All the while the dark war god of the north seeks to use Culainn as her own tool, her own champion. 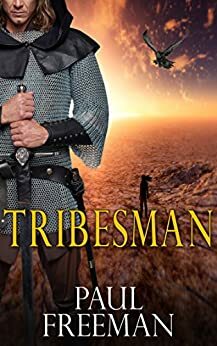 TRIBESMAN by Paul Freeman is an epic fantasy tale of a true warrior and an outcast, Culainn, who sets on a perilous journey in search of Cotterell the merchant's daughter abducted by clansmen. In the lands he wanders Culainn is often prejudiced, people calling him Tribesman, which he considers an offence. There are a lot of things I enjoyed about this novel and first of all I'd like to say I enormously loved the main characters, Culainn and Persha (a woman Culainn saves from a group of villains on one occasion). Paul Freeman is really great at characterization! Culainn makes a fantastic character. He is a strong, experienced warrior, blessed with the gift of sensing danger, yet haunted all the time by a dark goddess Morrigu, who is most often the sign of someone's impending death. Culainn and Persha are together wandering the deserts, facing malevolent demons and other creatures that seek to kill whoever they find in their way. It's a journey fraught with dangers and full of unpredictable twists and turns. The book is filled with masterfully-written descriptions of the harsh and barren scenery. There are also quite a number of intense action-packed scenes here that are very visual and really well-done. This will especially appeal to action-oriented readers, I'm sure. "Up close the creature's hot and putrid breath assaulted him as it snapped its massive jaws. The claws on its hind legs ripped at his thighs, while the front paws pinned him to the ground. He needed both hands to prevent the creature from ripping out his throat, all the while his legs and torso were being torn to shreds. ... He saw the blood-red eyes staring into his own and knew the beast was too powerful, his strength was failing fast. The creature shook its head violently from side to side in order to break free of his grip and get at him with its fangs. His muscles were beginning to burn from the agony of the demon's ripping claws." There were also a few flashback scenes into Culainn's childhood that helped relate to the warrior on a deeper level, and helped me get to know Culainn better. And it's not only about him, I should say, but about the other characters as well. I enjoyed Mr. Freeman's manner of writing--it's strong, mature, and just to the point. The scenes--especially the fight scenes--were very easy to visualize. It felt as if I were there, in the thick of the events. There were also a few romantic bits, not sickly sweet romantic, but appropriate for an epic fantasy book. One of the parts of the book that I enjoyed the most was Culainn's visit to Azral-Murbo, the City of the Dead, where he goes to save Persha. A great climax to the book! To sum up, this is a must-read for all fantasy lovers, especially those who enjoy epic fantasy! I look forward to future releases by this author! Great book, technically sound throughout. No typos, errors of any kind that I saw. Well thought out characters, fleshed out nicely, though leaving you wanting to know them a bit more. Nicely done. No "ta-da" moments, and I was able to immerse myself within the world Mr. Freeman created. Culainn. At first I did not like him. For some reason it took me a while to warm up to him. Persha I enjoyed, she is a great character that I was hoping the book would end up centered around(because I was wishing for demonic death for Culainn). Were my wishes granted? Read the book people! By the end of the book I had warmed up to Culainn, well written character, he was just a bit off putting for me at first. Lots of action, fighting, medium sized dialogue contained within the framework of the story. No odd soliloquies about how hot the desert is or long lost loves. Short, sweet and to the point. An economic book, pacing is very quick, you get from point A to point B quickly, and without a lot of fluff. I liked that. One thing that I did not like, and would have changed my scoring for the book. The ending. If this was a stand alone book, and not part of a series(I did not know it was at the time I finished it) I would have given it a 3. All because of the ending. Now that I understand it is part of a series, and will continue on, I get why the ending was the way it was. At the time I was so angry about it. Read the book, and tell me if I over reacted to the ending. With all of the knowledge I now have, the scoring on the Papi Z book-o-meter is 5 out of 5 stars. I enjoyed the book a great deal, and I feel all of you will too. This is one of those frustrating times when a book could have easily made it up a notch in my rating. It sat on the brink, tipping both ways, but in the end, it fell just a hair short. For the first quarter of the book, this was making its way into the I REALLY LIKED IT group. However, the further I read, the more I started losing interest. First off, we’re introduced to the main character who just woke with a hangover. Immediately, I liked the Tribesman. He was a tough guy, picked on because of his race, and we were shown quickly that he’s not afraid of confrontation. I’m rubbing my hands together in excitement. As I continued to read, I still liked our Tribesman, but when more characters were introduced, he started to fade. Reason? They allll talked the same. In the beginning, the landlady and a few ruffians had a lazy dialect. They used contractions, where our Tribesman did not. Cool, right? Well, that faded pretty quickly. Soon, the dialog just felt heavy, jerky, and kept me from getting into my beloved reading trance. It never bothered me that the Tribesman spoke formally. It gave him a unique voice in the beginning, but like I said, when others joined, he got drowned out. Seriously, that was my biggest beef. Towards the middle, it all began to run together. I missed that distinction I felt in the beginning. I understand not every word that can be a contraction should be a contraction, but when there’s a good chunk of dialog, it just doesn’t flow when everyone speaks stiffly. There were some awesome fight scenes. Then there were some I was hugely disappointed in. First, Tribesman is a badass. I enjoyed it when we were fighting there with him, right in his mind. But then there were sections where a fight was coming, then all of sudden it was over. We were then told what happened. For example, bad group of guys were coming up the stairs and never saw their deaths. First guy fell with a dagger in his throat, second with a stab to the chest, and so on. For me, personally, I would have rather been with Tribesman as he did all this stuff, not seeing it from outside. I understand this is totally a personal preference. A lot of action scenes are written this way. But when Freeman gives me a taste of awesome action and then tosses me a scrap like that, I feel a little cheated. Also purely personal tastes is my dislike for head hopping mid scene with no formal break. One minute I’m with Tribesman after a big fight, and then all of a sudden I’m with another character. It’s always jarring for me when this happens. I really prefer a break to show a PoV change. One thing I very much enjoyed is that we stayed with our main character and his companion about 98% of the time. It kept me close to our Tribesman at a time I might have become bored if another storyline would have been introduced. If you’re looking for a strong female character, don’t expect one here. Sure, she puts up a bit of fight, but she’s more looking to be rescued. Shame, because when I first met our female protagonist, I thought she’d end up being a bit tougher. So overall, I never skimmed and read it in a single afternoon. I must say, it was a quick read. I enjoyed this book, but those few negatives kept me at a slight distance when there was every possibility to become hugely engrossed. What started out as an intriguing story with evolving characters and a lot of well developed twists and turns, devolved into a series of weird dreams, and battle sequences with a myriad of demons. As I said, the plotting was very well thought out, and kept you guessing, but I ended up skipping through most of the last third of the book so that I could see if there was a conclusion. It ends effectively with him headed in another direction, but I don't think that I will check out the next book. The excerpt to the next book starts out immediately with more battle scenes, so that's a "no". This is a stirring adventure story set in a fictional world with a wonderful depth of detail and mystery to it. Culainn, an exiled warrior from the Northern clans, is hired by a wealthy merchant on a mission to the north. En route, his mission goes awry as he encounters rampaging desert tribes, demonic beasts, and a City of the Dead. Despite his unfortunate past, Culainn makes choices to help others, leading him to a fateful romance with a young woman who has many secrets. The characters are complex, well-drawn, and fascinating. The story itself is fast-paced, suspenseful, and very well-written. Is the raven god Morrigu leading him to his doom? Can he trust the burly fellow tribesman he meets in the City of the Dead? It makes for a gripping tale. Hopefully, there will be sequels and a movie. Awesome and epic. Those are two words that are often overused to the point where their original mean has been diluted beyond recognition. And yet, with regards to Tribesman, those two words are particularly applicable. The breadth, depth and scope of the world created by Paul Freeman is awesome in its development and epic in its delivery. Culainn is a dynamic character who has made some poor choices in his past and is dealing with the consequences of them. He undertakes a quest to retrieve a merchants daughter. Along the way he meets Persha, an beautiful dessert nomad, and an outcast just like the warrior of the north. Together they battle demons, hell hounds and search for the lost city of the dead. A story of magic, gods, love and betrayal, Tribesman is truly an epic adventure. I deeply enjoyed this story. It is one of the few e-books that I've read that I plan to also purchase the printed copy when it comes out. It has earned not only a place in my kindle but on my shelf.